(CNN) - South Carolina is draft central. The state that played a key role in the Draft Goldwater movement before the 1964 presidential election has already spawned two draft efforts this year aimed at luring Indiana Rep. Mike Pence and New Jersey Gov. Chris Christie into the 2012 race (both have declined). Now it's Sen. Jim DeMint's turn. 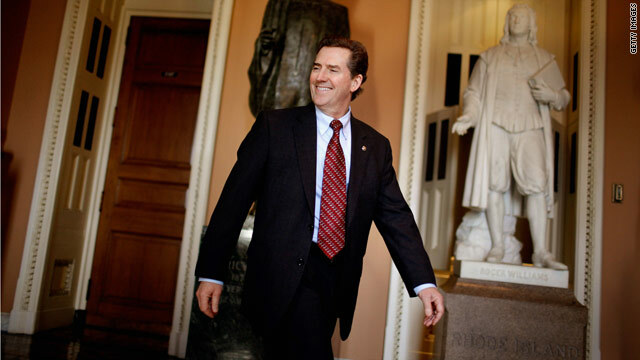 A group called Conservatives4DeMint has organized a "Draft Jim DeMint" rally for Saturday in the senator's hometown of Greenville, and two GOP members of South Carolina's Republican congressional delegation are lending some authority to the event. Rep. Jeff Duncan will headline the rally, his office confirmed to CNN Friday, and organizers say that Rep. Trey Gowdy will send a letter to be read to the audience of DeMint supporters. Duncan's attendance "should be viewed as a sign for his appreciation to Sen. DeMint and recognition of DeMint as a leader willing to fight for conservative principles," said Duncan spokesman Allen Klump, who cautioned that Duncan's appearance is "not a condemnation of the current GOP field." Gowdy spokesman Robert Hughes said the Congressman "has a great deal of admiration for Senator DeMint and respects the fact that he is praying over the decision." Hughes said Gowdy is "looking for a transformative leader, like Senator DeMint or Rep. Ryan, to face our daunting challenges and re-inspire trust in the institutions of government." Some DeMint advisers have urged him to join the race, but DeMint has said he has no intention of seeking the Republican nomination. DeMint, though, has said he will at least entertain the possibility "out of respect for the people who have asked us to think about this." But in an interview with CNN's Chief National Correspondent John King Friday, DeMint indicated that despite the rally Saturday he had no plans to join the field. "No, I have no plans to run for president and frankly the more I see of the Republican field the better I feel about it. I think it takes a while for candidates to develop and get their footing, and we may have some new folks join the race too, so its too early to say it's a weak field. I think we'll end up with a good candidate, and any of them would be better than what we've got in the White House right now," DeMint said. SC is a terribly underperforming states and if they didn't get more back from the Federal government than they pay in, they would be in even worse shape. Look at almost any indicator (people below poverty level, crime, infant mortality, unemployment, on and on and on) and then tell me why on earth would we elect a leader from this state to lead the country. I'm all for that. Draft him and send him to Afghanistan. Dream candidate–for Democrats. He has alienated, African Americans, Latinos, gays,retirees. He would not do well in November at all. But the right wing extremist can dream. That should set the wealthiest up for even more money. Go ahead you old fools. Vote against your best interests and against the UNiTED States of America again. By all means, make him the nominee. He wouldn't win 5 states if he was on the ballot. When they no longer can find a candidate to support their crazy beliefs, draft one that has crazy beliefs. What a joke! take the baggers with you and just leave What a Joke! The Marine need a few good men with leadership experience.